Open this thread with the request and hope to everybody here. He/she/it will help the MUN community gathering and defining the worldwide primary (best and first-class) locomotives, indifferently of their engine. After gathering a list of models it should be presented to Mr. Sieber jr., Maerklin's geschäftsführender Gesellschafter (acting manager and owner) as proposals and wishes from in Maerklin interested customers in general and Insider Club Members of peculiar interest. the worldwide primary (best and first-class) locomotives, indifferently of their engine. The LNER Gresley Pacific A4 class are/were at the pinnacle of steam worldwide, but Maerklin doesn't do British locos so my suggestion is purely for the record. Beyer Garrett locomotives were used around the world on different gauges. I would love to see Marklin make a standard gauge version of one of these impressive locos. There are more millionaires (with children) living in India than any other country. If I was in the marketing department at Marklin, I would be pursuing this market with everything. Now the Indians for a long time used British built steamers, but lately have taken on German built trains and technology. And just to add fuel to this fire, what about China? Apperently they have gone mad over the German Storck made Knopper wafer chocolates. Which also happen to be a favourtie of mine. There are probably a few millionaires live there too now. Does not matter, if you think it is for the record or not - list it. After a certain assembly of locos, we start a poll. These polling generates us a list, we hand out to the Mr. Maerklins. I do not hesitate to make a personal appointment with the Maerklin owners. And we ask them: why not English locos for Maerklin? Where are the differences e.g. to a Big Boy from the US? Please list all the names from these locos here. What do you think about Australian locos? Anything from Trix Fine Art range in a more affordable model especially KPEV class EG507 and T18 steam loco and BR T16, and DRG H45 Turbine Steam Locomotive, and E Lok ES 6 Halle der K.P.E.V. Diesel railcar VT 137 "Stettin"
NS Electrical railcar "Plan V"
The Hornby A4s are not bad for the money,i had two of them,one Dublo 3 rail DC and one anniversary with goldplated driverods,and sold them because they were DC and 00 scale. 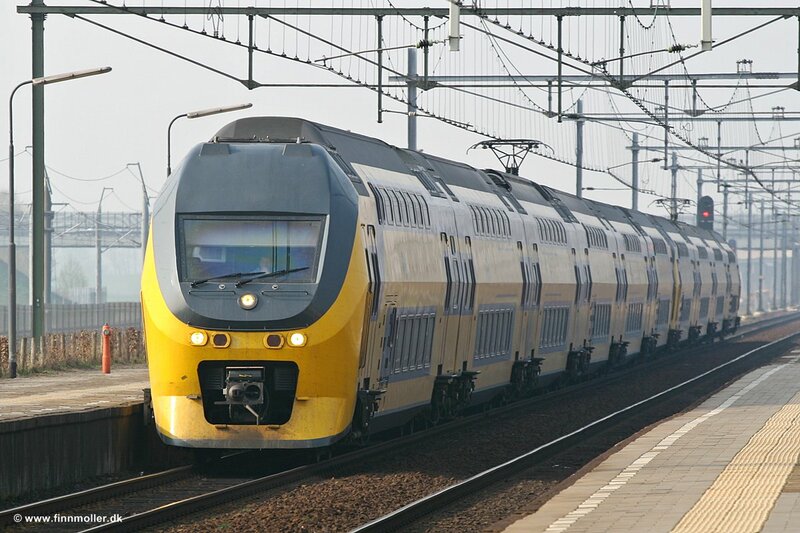 NS series 2200 and 2400,once the backbone of all freighttraffic in The Netherlands. Marklin to make them full metal with metal handrails along the enginehood. Series 2200: 150 locomotives built for NS. 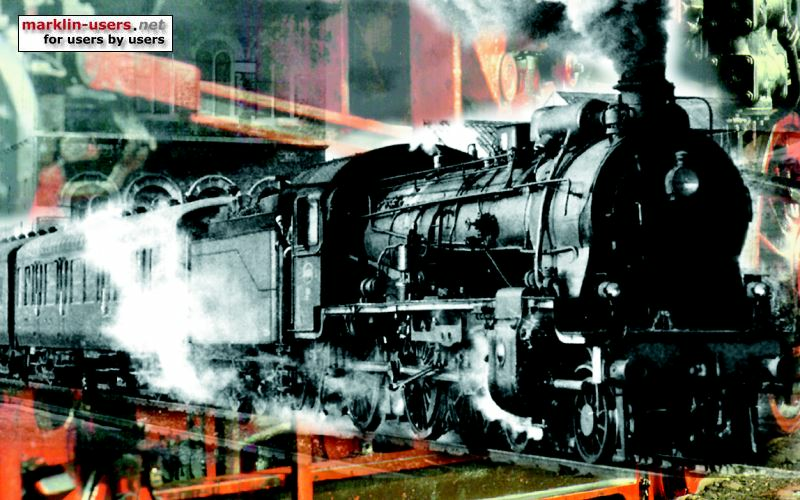 Series 2400: 130 locomotives built for NS. Interestingly, the A4 has a German connection. Nigel Gresley (SNG) who was Chief Mechanical Engineer for the LNER at the time, was well acquanted (maybe even friends) with Richard Wagner, Chief of Design within the Deutsche Reichsbahn in Germany from its inception in 1922 to 1942. SNG personally travelled to Germany in 1933/34 to inspect developments on the diesel powered fast trains then being built. As a result he developed the high-speed trains on the LNER in the years 1935-38, such as the Silver Jubilee and the Coronation. He stayed with steam power using lightweight construction of the trains (like Wagner). After trials with earlier models of steam (A1, A3) he built the first of the streamlined A4 in 1935, and subsequently 35 in total. The NSWGR AD60 Garrett has been mentioned, but there are so many others that qualify in my book. Lima made a NSWGR C38 Pacific in the 1970/80 decades that proved very popular. 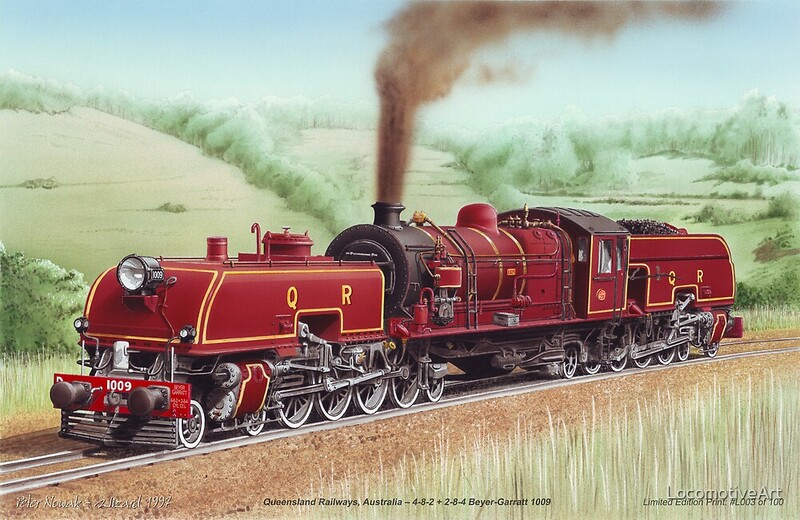 South Australia had large impressive broad gauge locos that looked almost American. a classic and powerful electric. Thank you for your post which I enjoyed very much (more so with the sound turned up)! I have never before seen movie image of double-headed Garratts - fantastic. You may be interested to note that Garratts first appeared in Australia in Tasmania, by commission of the Tasmanian Government, hence my interest in Garratts. I would think I am dreaming to expect Märklin to produce a Garratt Model. Yes please. I did wonder if it might have a special anniversary this year, but it was 1934 it did the first officially recorded 100mph by a steam loco. Prior to that City of Truro is reputed to have done 100mph quite some time earlier, but it wasn't a verified speed attempt. Looking at the list from the Insider questionaire, I won't be surprised if it is the Vanderbilt for the US market, to complement the Challenger from last year (or was it the year before). Any early "general purpose" diesel with dynamic brakes as, EMD GP7 or GP 9. Or a second generation diesel as EMD GP 30. 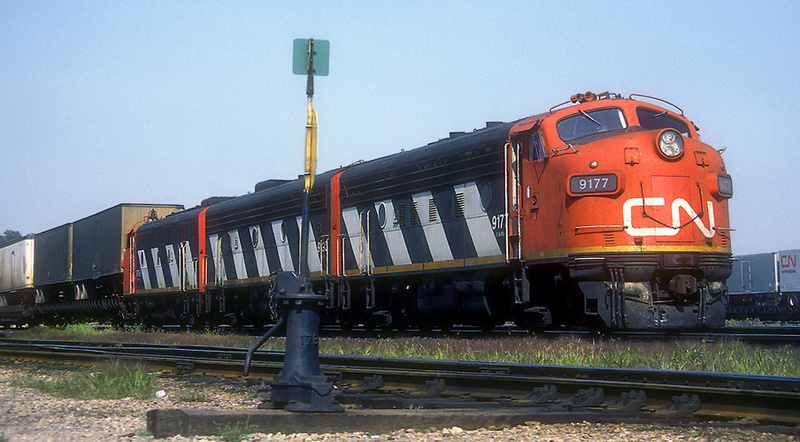 Would love to see the good old F7 in CN colors. 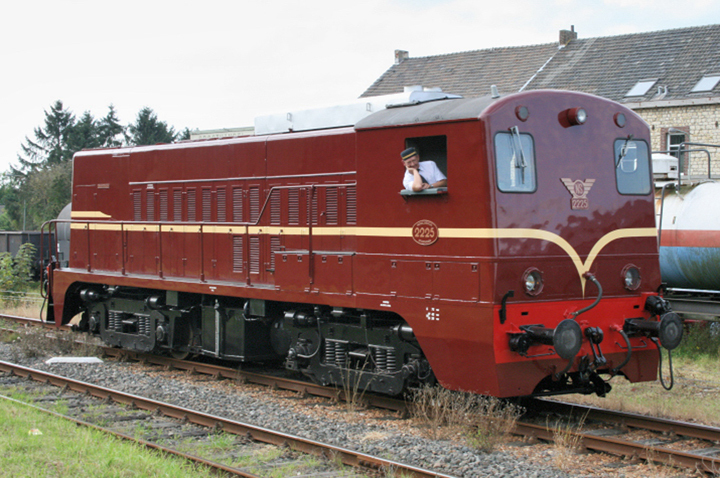 How about a nice Volker Rail train? May I put my hand up for a Swedish SJ RA class? Nice shots of Beyer Garretts. I worked on the Northern Rhodesian, later Zambian, Copperbelt. I knew 'em well. There was a tale that used to go around that steam loco drivers who had been banned for drunkeness in the UK could always get a job again in RSA, and if they blotted their copybook again there they moved on to Rhodesia Railways who would hire them, and the last stop on that road was driving on the Copperbelt mine railroads. True or not, many of the mine engine drivers I knew were lushes, although I am indebted to one of them who sometimes let me take control of the steam loco (not a B-G) running up to the main concentrator from the outlying mine where I was night-shift Mine Captain. it seems that at some point or other many people served time in that part of the world. This is me at Shaft 14 in late '73, it was another two years before I went underground for the first time at Stork Shaft in a bi level man cage, quite an experience!!!!! 39912 AC12 Cab Forward Southern Pacific in wooden box - 849 EURO. But a guess, Just a dream. impressive this listing. More as I expected and I am just reading, reading, reading and of course try to find pictures of each loco in the internet – not an easy job. Unfortunately I do not know most of them and unfortunately not for every loco is a picture available. But yes, this summary is going in the direction I was thinking about. Also I think we should evaluate a primary locomotive for each country, especially your country. E.g. in the US it is very obvious the "Big Boy", in Germany it will be the steamer BR 01 and BR 103, I think (other opinions welcome). But I guess that every country has such popular locomotives. Who knows them? So we find and define this primary and “first of all” loco for each country. Then define the version of this loco. This impressive collection of locos reveals already the plenty of locos built in various versions, even across country or railway company borders. Out of this massive range of locos we shall find the only one country locomotive, we at MUN like and want. But beside the locos we shall define which function should be possible with these locos. After a CS is able to toggle 32 functions, we should define which ones are desirable. E.g. Maerklin has since several decades the Telex coupler. Why only an automatic coupler at the loco and not for each coach? 16 addresses will be good for 8 coaches. The current coupling is already in use. This makes to me more sense instead of getting an announcement like “das Fett brennt” (the fat is burning). I start less with the propulsion of the engine, I would start more with the most loved, well known, or whatever loco in this country. And of course there could be more than one. Then we have to do a ranking within these country locos. That's very true. I have visited mining camps all over the world and there was usually at least one ex-Copperbelter there somewhere. There is even a site http://www.greatnorthroad.org/ for veterans of the old Northern Rhodesia/Zambia if you want to indulge in a little nostalgia. I'd left before '73, I knew Luanshya well, although I worked at the Nchanga and Nkana mines in Chingola and Kitwe. For those of you wanting a NSW 46 class to run on their Marklin set up, consider the Auscision version. Although it is 2 rail, I found it not difficult to convert to 3 rail operation, I just put a pick up shoe underneath on one of the bogies. Usually with such conversions I also change the wheels to NEM types (bigger flanges) but in this case I did not have any of the right size so stuck with the existing wheels. It runs without any problems on my layout, which is half K track and half C track. 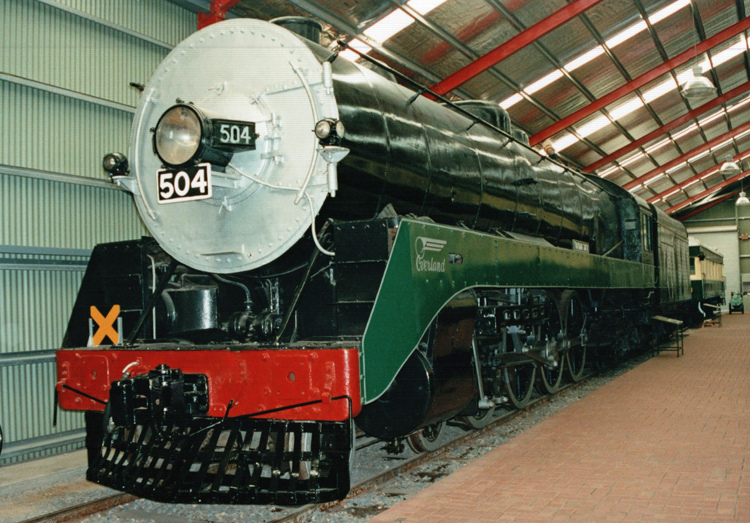 I think the success of the bigboy in places other than the USA indicates that a standard gauge Beyer-Peacock Garrett in HO would be a successful model given its distinctive design. So how do Marklin do the scale to run on HO scale track = 16.5mm? Queensland Beyer Garrett, possibly similar to the RHodesia and S African garretts. From a marketing point of view, you have to realise that railways are not uppermost in the Australian mind. The railway network is quite sparse, because one third Australian population is conentrated in 3 greater urban areas, Melbourne Sydney and Brisbane. There are few passenger services outside of these urban areas. To illustrate, Aldi put a Marklin train set on sale in Australia in Christmas 2015, and there were many sets remaining on the shelf in mid-2016. So while the train set can be made attractive, there is little market here. Overseas buyers will take Australian models, more than Australian buyers perhaps. Victorian Railways (Australia) had a similar double-cab electric, a different shaped nose. He has just left a major repair at the Bayerische Museum in Nordlingen, will be at IMA Göppingen, is famous and has appeared in many films. A tinplate Rio Grande caboose for my good old Rio Grande F7 A units? Hornby made the 'diesel' with one cab locos in 1970s. All nice big chunky locos, which would be great to see in metal with MFX+ decoders. And to go with them, an old Marklin model, but as new tooling for an Inox DEV. The last news from Göppingen confirm me that Marklin is making a new Tooling of SNCF 241, we don't no if A or P.
They don't confirm is the special loco for now, or it will be on NH2018... but SNCF 241 is on way!!! Definitely a great idea and something that would be welcome by many people here in France, as I suspect that there will be a 2 rail TRIX version. As for the DEV Inox, maybe it's time to get the LS Models of pre-TEE days Mistral sets before they're all gone! Of course if Märklin adds these too...I'm going to be broke again for a while! See ya next week in Goeppingen! I like to, but I will not be able to go this year☹️, I think they might announce the 241a in Goppingen perhaps:-) maybe have one running as it's based I think not to far away. Xmas, so maybe they will do the same. It I imagine will not be on sale, until much later. As I usually the case. Moved topic from 'News from Marklin' forum to 'General MRR', as this thread contains anything and everything except actual news from Marklin! US based diesel engines, japanese high speed trains. US steam machines like the Allegheny.